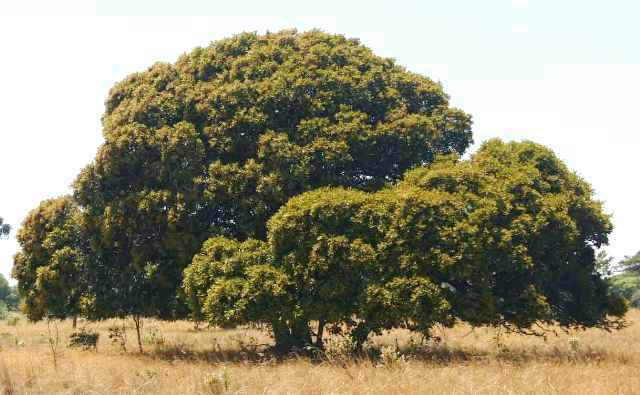 Other names: sand apple, cork tree, hissing tree, grysappel, mbula, munanzi, mbura. 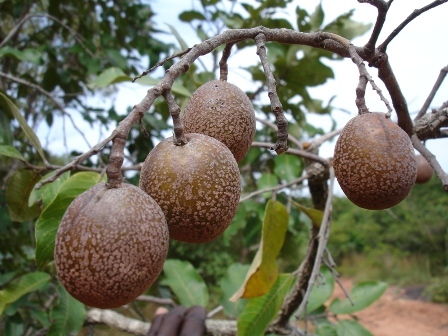 Mobola plum is widespread in tropical Africa from Senegal to Kenya and southwards to northern South Africa, with the highest concentration in Zimbabwe and the low veld region in South Africa. It is quite common, gregarious and locally abundant. The tree bears very tasty sweet fruits. So this tree is not cut when the forests are cleared for cultivation. This tree is resistant to fires. Mobola plum mostly grows in open woodland, wooded grassland, savannah and often on rocky sites, in areas with a mean annual rainfall of 400-2300mm, a mean temperature of 10-30°C and altitudes of 1100-1900m. found near rivers. This species is very variable in size and shape, ranging from small shrubs of 3m tall to large trees of up to 20m high. The tree is evergreen, with pale green, spreading foliage forming a dense, rounded, umbrella shaped crown, which casts heavy shade. The branching is low, and the bole twisted, 25-40cm in diameter. The bark is deeply fissured, with square or rectangular blackish scales and deep red slash. Young shoots are densely covered with yellowish woolly hairs. The leaves are simple, spirally arranged but sometimes looking alternate, elliptic to oblong, 5-17 by 3-8cm. They often have small galls and up to 20 pairs of fusing lateral veins. The petiole is pubescent, 6-10mm long, with 2 circular glands. Inflorescences are usually paired, terminal, many-flowered panicles of more or less lax cymes, up to 20cm long. The sweetly scented white flowers are tinged with pink, 4-6mm in diameter, with 5 petals and 5 sepals in compact heads. Fruit is an ovoid or sub-globose drupe, yellow-red in colour, turning brown as it ripens. It has rough, scaly skin, with golden coloured warts on the surface. The fruit measures up to 50mm long by 30mm wide, with a hard stone embedded in a reddish thick fibrous pulp. The hard and woody endocarp (stone) is 2 cm in diameter, containing 1 or 2 embryos (kernels). Each stone with the pulp removed is usually considered as a seed. Each seed weighs 3-4 g.
The tree has long flowering and fruit ripening periods that often occur concurrently during the rainy and dry seasons. It takes 9-10 months from flower fertilization to fruit ripening. The tree flowers from July to October in Southern Africa and fruits from October to January. 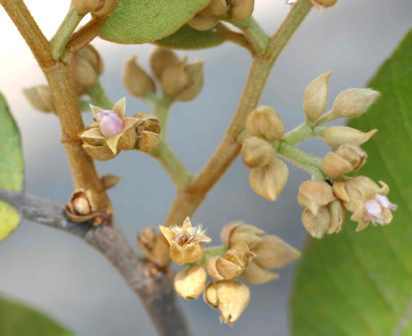 In Kenya flowering occur from December to March and the trees fruit in May-June. Not all trees bear fruit every year. This species naturally regenerates from seed and also from coppice. The fruits can be harvested when they turn yellow orange. 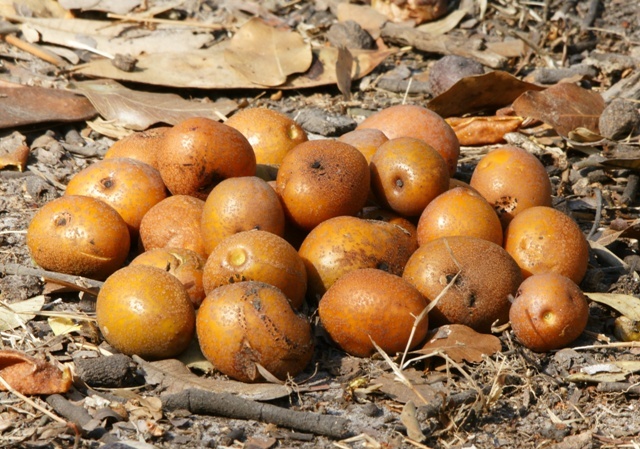 They often fall to the ground before they are fully mature, but it is not recommended to collect fruits from the ground as they can be heavily infected. About 5 kg of fruits produce 1kg of seeds. The fruit skin and pulp are removed with a knife and the seeds washed with water. For extraction of large quantities, the fruits are soaked in water for 24 hours, and then pounded in a mortar using a pestle with some coarse sand. After mixing well with large quantities of water, the fruit skin and pulp can be poured, leaving the cleaned seeds behind. Extracted seeds should be sun dried for at least 2 days. The tasty, sweet fruits are highly valued. The fruits have a high content of vitamin C and are eaten fresh, cooked as porridge or made into beer. They can also be dried and used as a reserve food. The nuts are eaten alone or mixed with vegetables. in kernels). The edible oil is used for cooking, paint, varnish, soap and others. An extract from the bark is used in tanning and for dying in basketry. 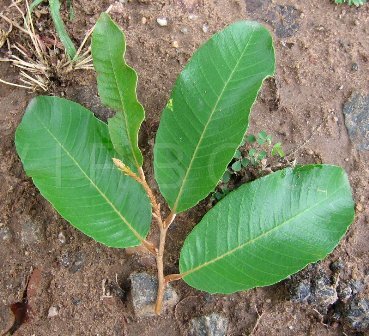 Roots and bark are used to treat several diseases and for the treatment of snake bites and fractures. The twigs are used as chew sticks. Root infusion used for stopping toothache. The timber is very durable, hard and heavy (720kg/m3), and is often used for fine woodwork, mortars, canoes and mine timber. The wood contains a high quantity of silica crystals and is strongly fire resistant.